A Palestinian amora of the third generation (fourth century). He was the contemporary of Abbahu ("Die Ag. der Pal. Amor." iii. 546), Zeira I., and Abba II. He was surnamed Arika, an appellation of disputed meaning (compare Jastrow, "Dict." 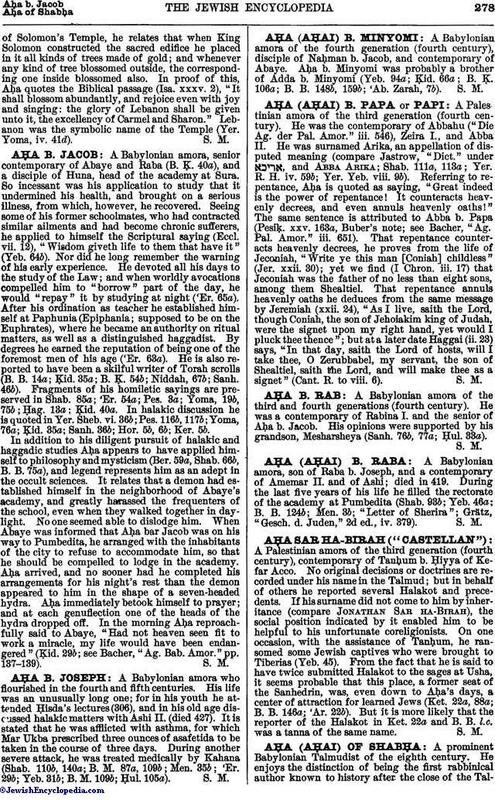 under , and Abba Arika; Shab. 111a, 113a; Yer. R. H. iv. 59b; Yer. Yeb. viii. 9b). Referring to repentance, Aḥa is quoted as saying, "Great indeed is the power of repentance! It counteracts heavenly decrees, and even annuls heavenly oaths!" The same sentence is attributed to Abba b. Papa (PesiḲ. xxv. 163a, Buber's note; see Bacher, "Ag. Pal. Amor." iii. 651). That repentance counteracts heavenly decrees, he proves from the life of Jeconiah, "Write ye this man [Coniah] childless" (Jer. xxii. 30); yet we find (I Chron. iii. 17) that Jeconiah was the father of no less than eight sons, among them Shealtiel. That repentance annuls heavenly oaths he deduces from the same message by Jeremiah (xxii. 24), "As I live, saith the Lord, though Coniah, the son of Jehoiakim king of Judah, were the signet upon my right hand, yet would I pluck thee thence"; but at a later date Haggai (ii. 23) says, "In that day, saith the Lord of hosts, will I take thee, O Zerubbabel, my servant, the son of Shealtiel, saith the Lord, and will make thee as a signet" (Cant. R. to viii. 6).